Well, the yearly trip to the Qld Quilt Show has been done today, now I'm tired, hungry & broke. But had a good day, lovely stash of threads bought, lots of lovely quilts viewed, and lots of chatting. Before I go any further, I must comment on the Pe-ac-ed with Love quilts, they were wonderful, moving and very special. They were story quilts made by war veteran family members, many of them not even quilters. Well done. Nice to see Lisa Walton up in Brissie (hello Lisa!! 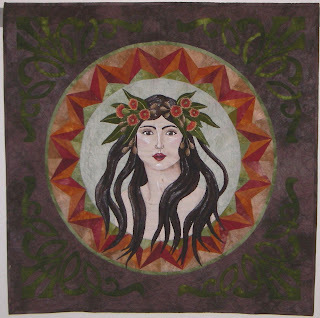 ), her quilts are so vibrant and colourful. I had a lovely chat with Helen Godden, nice to meet you Helen. Whilst Lisa was lucky enough to bag a few ribbons for her entries, not so for me this year, but no matter, I still enjoyed making my quilts, and we must all take our turn in receiving awards. Anyway, you might like to see what I had entered, so here it is. This piece is called "Dryad of the Eucalypt" I really enjoyed making this piece, here's a close up of the gum blossoms. I enjoyed working in the earthy tones. Before I made this one, I did a very similar piece, "Rahn, Goddess of the Sea", and as I enjoyed it so much, I had to repeat the idea with a different theme. They were very much art nouveau inspired/influenced, and the flowing, elegant nature of this art style appeals to me very much, so it would be safe to say that it will appear in future pieces, between birds, that is...hang on...one could say these pieces are 'birds', just a different sort, hehe!! Thanks for the nice words Bernadine - great to see you again. Your work is really amazing - you are a real artist. love your dryad, she's gorgeous. You haven't posted in so long. I miss seeing your work. So I've tagged you in the hopes you'll start blogging again. 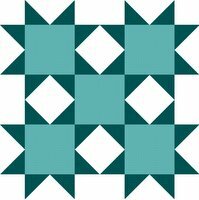 Bernardine, I just discovered your blog from your sig on AlternativeQuiltList. Your work is so beautiful! What a lovely treat for me today!